A village in the southern part of Hubble Township, on the Belmont Branch of the Iron Mountain Railroad, one mile northwest of Delta. Andrew Franks received a concession of land here in 1798. The town was laid out in 1869 by Thomas Allen, president of the Iron Mountain Railroad, and Thomas A., J.E., A.J., and J.W. Renfroe. The principal streets were named Renfroe Avenue, for the Renfroe brothers, who were prominent farmers; Penny Street for William Penny, who came from Wales in 1808 and settled in this neighborhood; and Rodney Street for Martin Rodney (or Rodner) an early settler who owned a large farm south of the town. The town was named for Thomas Allen (1813-1882), who projected and built more than 1,000 miles of railroad. Thomas Allen was born in Pittsfield, Massachusetts, studied law in New York and was admitted to the bar in 1835. In 1837 he established a newspaper in Washington, D.C., and in 1842 he came to St. Louis. From 1850-1854 Mr. Allen served in the State Senate. He was president of the St. Louis and Iron Mountain Railroad, and served in Congress from March 4, 1881 until his death in 1882. 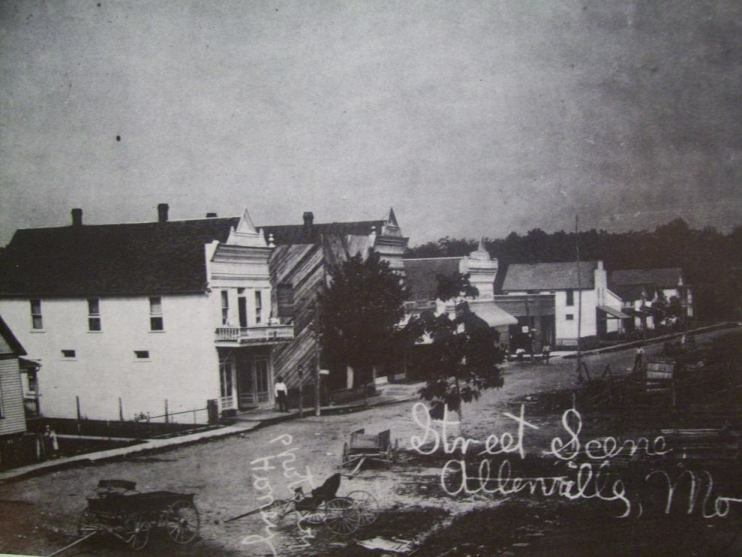 A Brief History of Allenville, MO. A long time ago, in fact in the early 1800�s, the town of Allenville started forming. It had three things going its way: it was on high ground on the banks of Whitewater Creek; it was on a direct route to the Southwest United States; and it was about a day�s run for covered wagons coming from Cape Girardeau and the Mississippi River. Another thing was a great swamp running down through Southeast Missouri. You couldn�t cross it. You could go down the east side through Benton, Sikeston, New Madrid, and probably farther. You could also go down the west side through Allenville, Bloomfield, Dexter, Bernie, Campbell, Kennett, Senath, and Hornersville. But you couldn�t go the 25 miles across (east-west) from say Kennett to Caruthersville. This was cypress - tupello water bog swamp even in dry weather. So all of the produce (cotton bales, cattle, etc.) from the west side of the swamp and part of east Arkansas came up to Cape Girardeau and the boats on the Mississippi River through Allenville. All of the settlers going to the great Southwest went this way. Whitewater River was bridged at Allenville; Castor River was bridged at Aquilla; St. Francis was ferried near Paragould, Arkansas; White River forded near Newport, Arkansas; and the Arkansas River ferried near Little Rock. The road from Cape Girardeau down into Arkansas became known as the Bloomfield road but in most of Arkansas it was known as �The Military Road�, and it is so named yet today. The bridge across Whitewater was burned during the Civil War but the great builder Joseph Lansmann of Cape Girardeau built back a masterpiece right after the Civil War. Before long, Allenville had another piece of luck. A railroad from St. Louis was extended from Ironton down to Allenville and thence on down through Delta, Oran, Sikeston, Charleston, and ending at a port (ice free) on the Mississippi River called Belmont. The railroad trains from the Southwest came though Allenville now for there was no bridge across the Mississippi River at Thebes, Illinois. Allenville now sat on a main line railroad (there was also a branch going from Allenville to Jackson) and on a �super highway� and on a pretty big river. A rich man (a railroad builder) from St. Louis named Allen decided that here would, someday, stand a great �Metropolis� so he bought every acre of land in and close to Allenville that he could. He had the town platted and even today you can make out the boundaries of the wide streets and alleys. The Allenville plat is recorded in the County Court House at Jackson and all streets are named. At one time there was in the City of Allenville the following: a large whiskey distillery (wholesale only), a newspaper, bank, milling company, bottling plant, casket store, 2 blacksmith shops (In 1910-20 cents per shoe or 75 cents per horse; in 1916 - 25 cents per shoe); wholesale beer house; 3 swinging door saloons; livery stable; Hotel Cox; pool room; 8 stores - some were big general stores; 3 cafes; livestock market; millinery shop; 3 doctors (8 altogether); meat market; calaboose - made of logs but later concrete; railroad watering tank; 4 barber shops; 2 churches; 2 schools; ice wagon that made a daily trip to Cape Girardeau; 6 trains a day plus 2 extras most days; 3 very large sawmills; a railroad log yard with steam loader; broom factory; scale house; grist mill; 3 town pumps; 9 hitching racks; a lodge; population 450 (the census gave less but it only counted the Allen plat); 1 full time delivery wagon; 25+ two story building - all but 1 frame); 1 & � railroad cars of binder twine sold per year; one house of �ill repute�; railroad depot with 1 acre of loading platforms; macadam road about 2 � miles though town; and Marshall Hull (better than Matt Dillon). I am interested in buying ALL Allenville Advertising. Email me.